Mash Up debuts tonight on Comedy Central at midnight. Comedy Central Presents… stand-up specials are pretty boring. I don’t mean the content, which depending on the comedian and his or her material, can be spectacular, interesting, abysmal, or Heathcliff-themed. The format of these half-hour specials, especially after all these years, is dull. 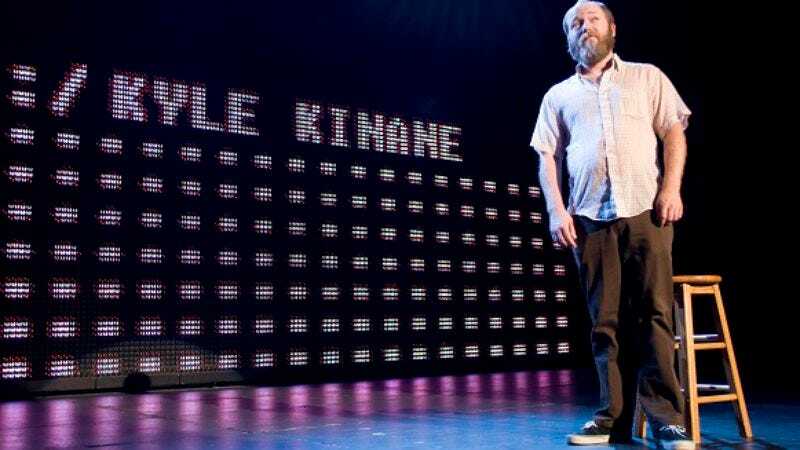 I went to some tapings a few months ago in New York (mostly to see Kyle Kinane, one of my favorites) and saw them setting up. Basically, they tape a bunch in a day, two at a time, changing literally only the backdrop—and even then it’s just a different font color and, obviously, name. It’s so streamlined at this point; there’s little room to do anything to make an individual special feel, itself, special. And the special itself doesn’t really still serve the purpose of “breaking” a comedian to a larger audience: Natasha Leggero taped one at roughly the same time, and she’d already been a judge on Last Comic Standing. At this point, the first half-hour comedians do for television is something to look back on and be glad you did, but it’s simply a stepping stone in a career. A standardized, bland stepping stone. Mash Up is refreshing. It’s got a vibrancy not seen in televised stand-up in years. And you can chalk it up to the presence of a director who, actually, wants to do something special with the “special” format. In full disclosure, I’ve known Jordan Vogt-Roberts casually for a while. He was a rogue comedy director in Chicago when I was serving time as the Comedy Editor of Time Out Chicago. He made these shorts for the now-defunct site Blerds.com, which blended the jokes of his favorite local comedians with cutaways to the comedians acting out the premises of the jokes. I totally understand if that description makes it sound kinda dumb, but it’s not. The videos worked as a strong showcase for the comics themselves, allowing for some additional humor to be drawn from the editing and directing of the sketches. In any case, Vogt-Roberts now does segments for Funny Or Die, but Mash Up is a pet project with roots in those Blerds days. The line-up is straight out of the back bar at The Lincoln Lodge: TJ Miller, Matt Braunger, Hannibal Buress, Kumail Nanjiani, and Kyle Kinane. They’re some of the best comics working today, and they’re all connected, like Vogt-Roberts to their time in Chicago. The sets were taped last year, so the material is killer and the comics are at the top of their game. Mash Up manages to be one of the better showcases for all five of these comedians, even though those guys have appeared on various Comedy Central shows at one tie or another. There's a looseness to their comedy, and a palpable excitement to simply be part of something new. Mash Up doesn’t feel at all like a typical TV showcase. For starters, there are plenty of those little sketch segments peppered into the stand-up—and much like they did with Blerds, they accent the jokes without being too distracting. (For example, we get to see just how happy kicking pigeons makes Hannibal Buress.) In between sets, there are unrelated sketches, some of which are in “mash-up” form—taking two words, combining them, and reenacting what that would look like in the real world. One of them is “hoboerotic,” which, you can probably figure out how that one goes. There’s a lot to take in: retro video game graphics, sketches called, “The 30 Seconds That Got You Fired,” a guy getting shot by a paintball gun in slow motion, etc. Mash Up is different, but it’s a little exhausting at times. The comedians get plenty of time to tell jokes unencumbered, but the cutaway to a sketch in the middle of a line can be jarring. I think that’s because we as audiences have been trained to watch comedy in a very straightforward way, especially on TV. Mash Up is an unexpected take on a tired form, and serves as a showcase not just for the comics, but for the man behind-the-scenes. It’s a hell of a lot better than simply changing the font color.